Note: This feature only works on OneLogin's ADC version 4.2.2 or greater. Active Directory has a number of standard fields that most companies use, and that OneLogin previously supported only by creating custom user fields and importing them afterward. OneLogin now generates these fields by default, allowing imported users to natively have a Manager, Title, Department, and Company associated with them without having to generate custom user fields. Self-service requests could automatically be sent to the user’s manager for approval. Managers in OneLogin could be allowed to see the users who report to them directly. Provisioning actions into apps like Expensify could automatically set who expense reports are submitted to, streamlining the expense approval process. Also, since the Manager field is closely related to the reporting structure in an organization, the field itself will be synchronized. 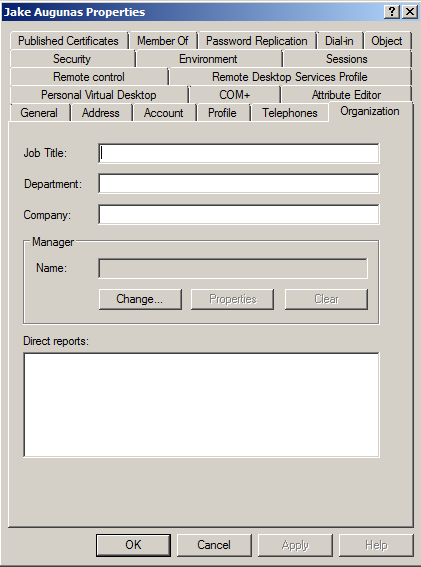 Seen below, the fields already exist within Active Directory. Now, these attributes will be imported over directly into OneLogin, including the managerial hierarchy structure associated with the user. 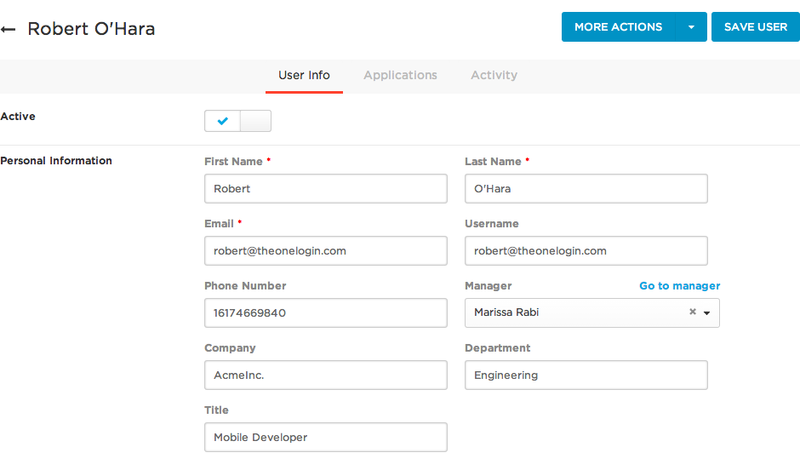 Within OneLogin you'll notice the standard fields for a user now contain Manager, Company, Department, and Title. The Manager field is special because you can now specify another user within the account to be considered the manager for this specific user. Likewise managers of managers will be mapped as well, allowing the function of Go to Manager to be used to follow the managerial hierarchy within the organization. You can also assign multiple managers for a single user, and go to each manager respectively. You can also directly create a new user under the management of the currently viewed user by selecting More Options > Create New Sub User. This will set the new user to automatically be linked to the current user, which will be set as that user's manager. If the users are being imported from Active Directory, user hierarchies and managers of managers will maintain the same relationship, as the entire organizational structure will be kept intact during the directory import.